Prepare yourself for the most mind-boggling dessert ever! 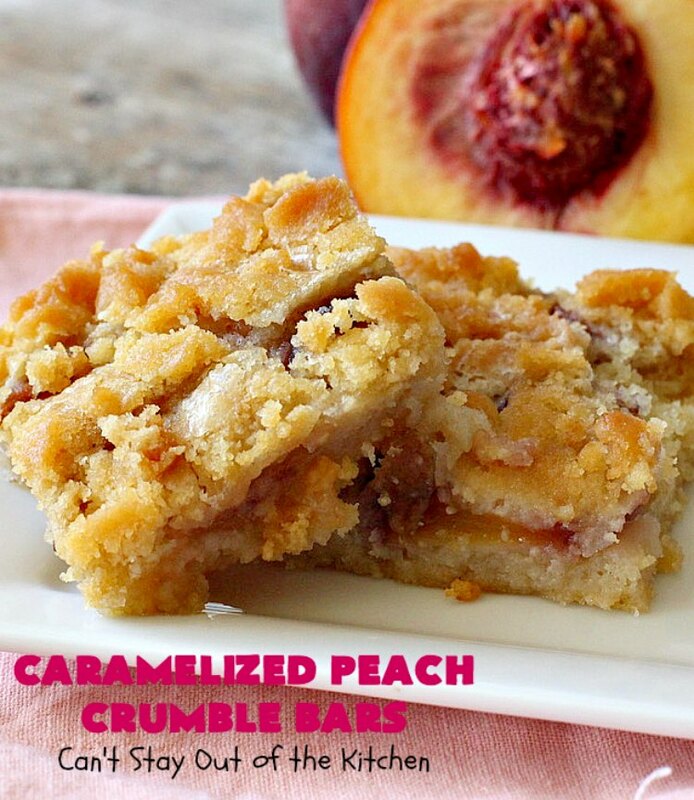 Caramelized Peach Crumble Bars. Yep. 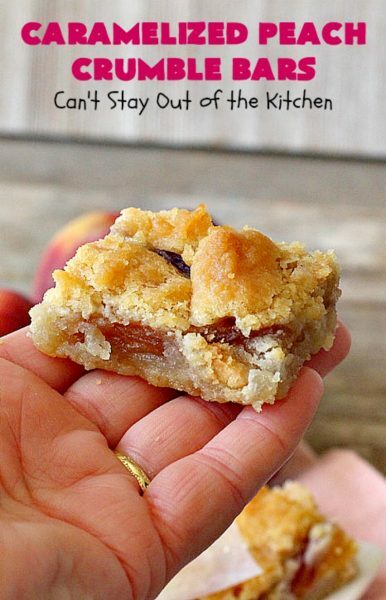 These ooey, gooey bar-type cookies are absolutely sensational. 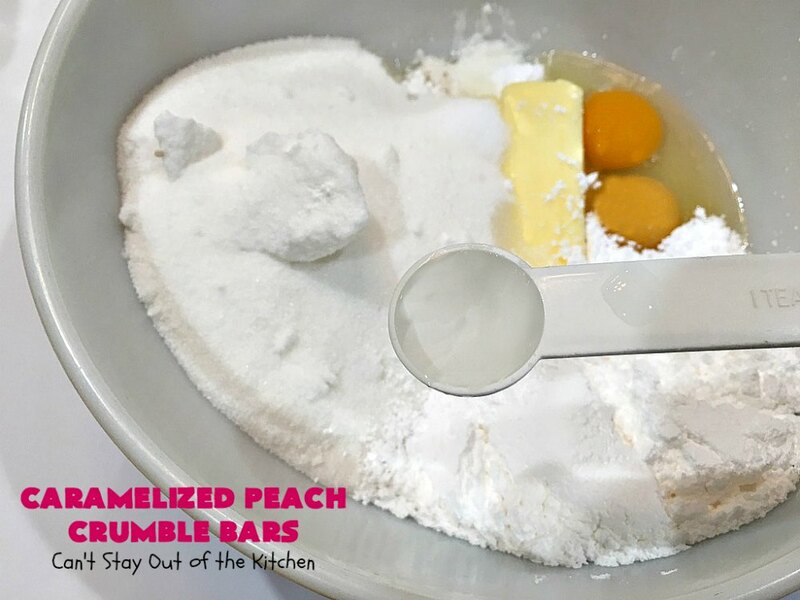 I started with my favorite sugar cookie dough. My recipe includes almond extract so it’s really terrific. I added a layer of peaches. The great thing about this recipe, though, was I didn’t have to peel the peaches. Nope. I layered them on top of the cookie dough without peeling them before hand. I caramelized some sugar with both vanilla and almond extracts. Whoa! After that was ladled over top of the peaches, I crumbled more Sugar Cookie dough over top. These fantastic cookies were so mouthwatering and delicious, I wanted to eat the whole batch! Back in August, I received a 20-pound box of fresh peaches from the Washington State Fruit Commission. They asked me to blog about my experiences with their peaches. 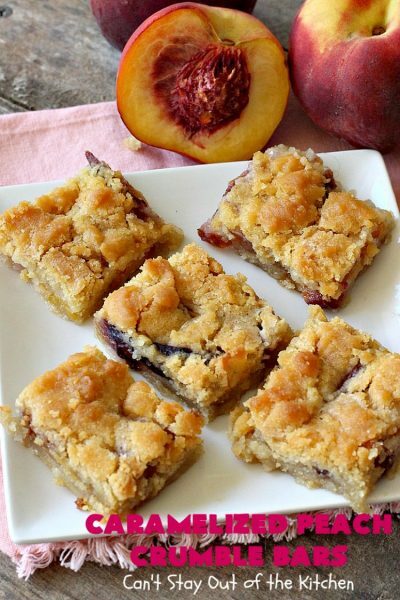 Instead of freezing or canning the peaches, I chose to make desserts with them. This turned out to be one humdinger of a recipe. But let me say one thing. 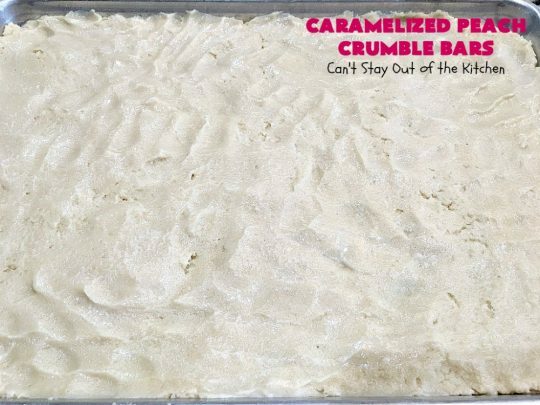 You will absolutely have to put this in a large 18×26″ cookie sheet (or larger). If you don’t have one that large (with an edge), you’ll have to divide the recipe into two large cookie sheets. Otherwise, it will overflow the pan. Caramelized Peach Crumble Bars are rich, decadent and utterly amazing. 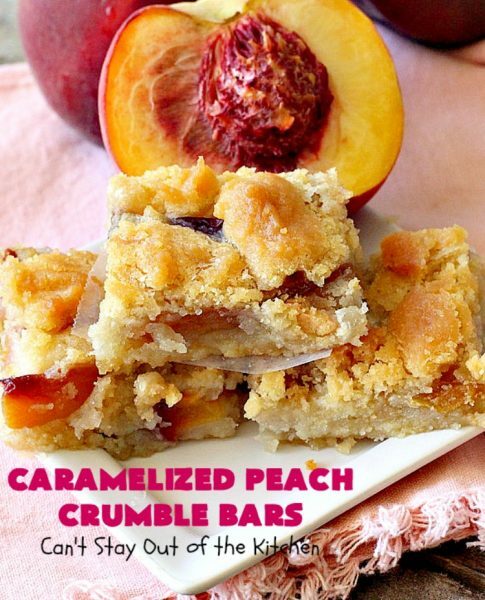 These lovely bars are terrific for tailgating parties or potlucks. 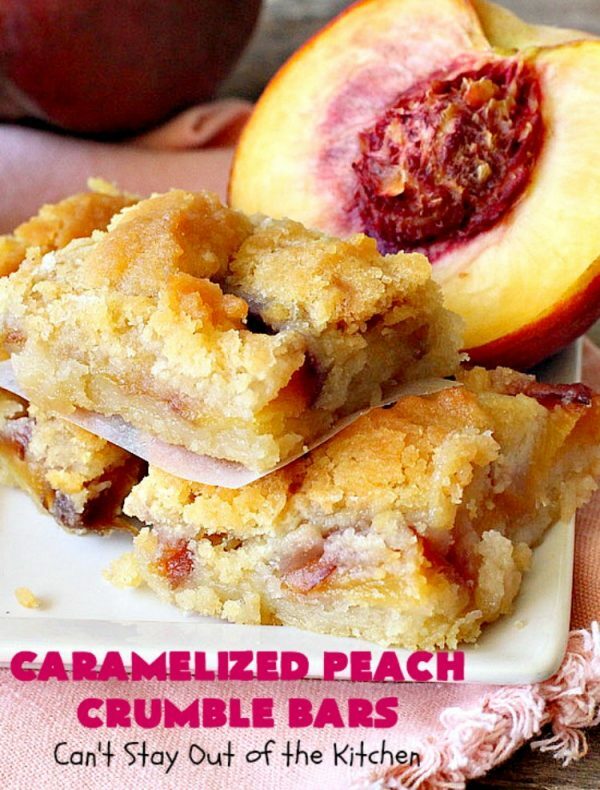 If you enjoy peaches, you’ll devour this dessert. 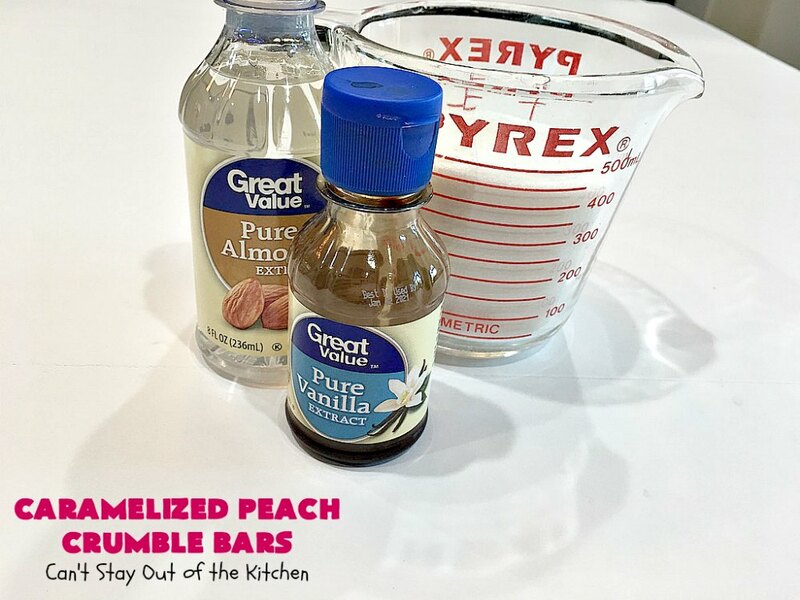 I used these ingredients for the sugar cookie dough and the peach layer. Soften butter. Add sugar, powdered sugar, eggs, almond extract, baking soda, salt and cream of tartar. 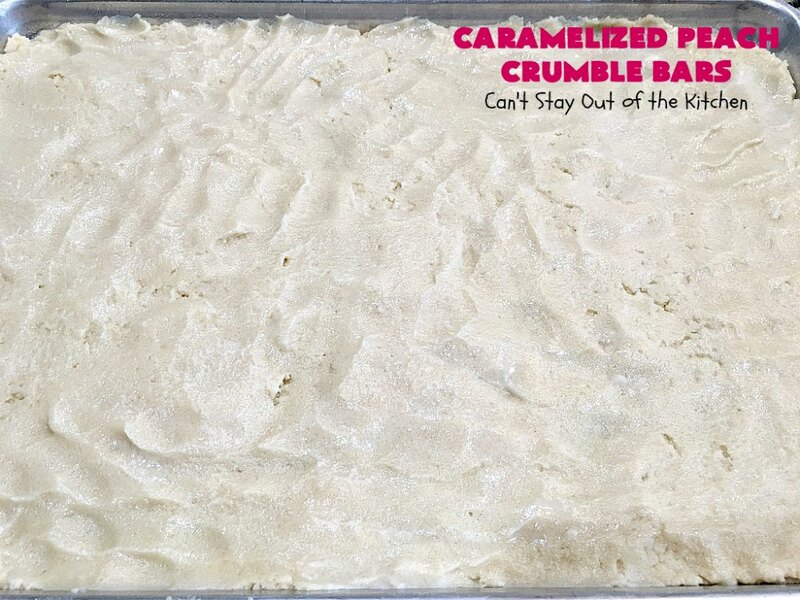 Press half to two-thirds of the cookie dough into the bottom of an 18×26″ cookie sheet. (If you do not have a cookie sheet this large, use two pans and adjust cooking time accordingly). I had to moisten my hands to press the mixture into the cookie sheet. Slice and pit peaches. Place slices about 1/8″ thick in layer on top of Sugar Cookie dough. 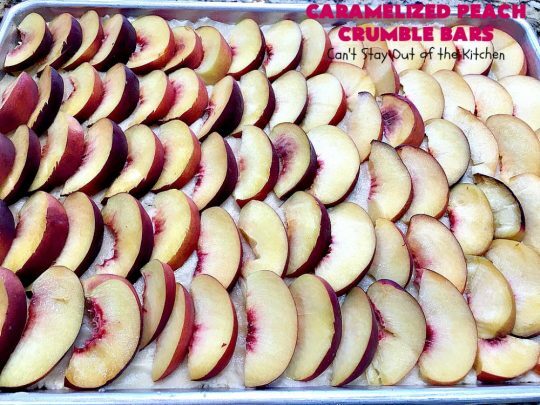 It is okay to overlap the peaches. I used these ingredients, plus water, for the caramelized sugar layer. 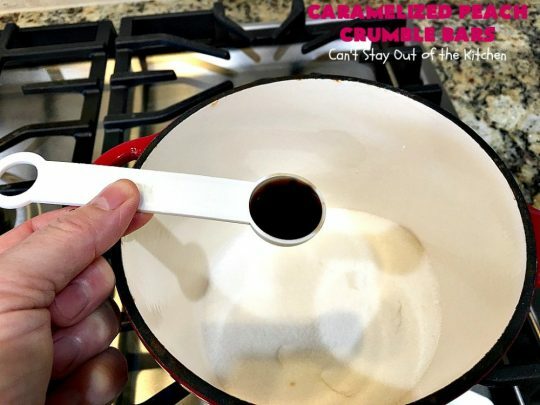 Place sugar in a small saucepan over medium heat. Add vanilla and almond extracts. Stir to combine, but do not stir sauce again. Instead, with a potholder on the handle, remove pan from burner every minute or two. Swish ingredients slightly so they don’t harden. Allow mixture to come to a boil and cook exactly 15 minutes (from the time you start cooking). Remove from burner immediately. 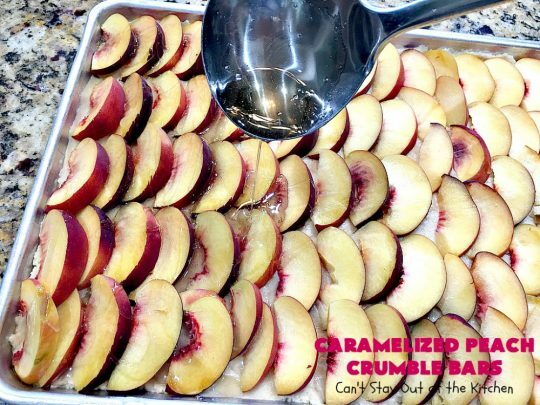 Immediately ladle the caramelized sugar syrup evenly over top of the peaches as quickly as possible so the mixture doesn’t harden. 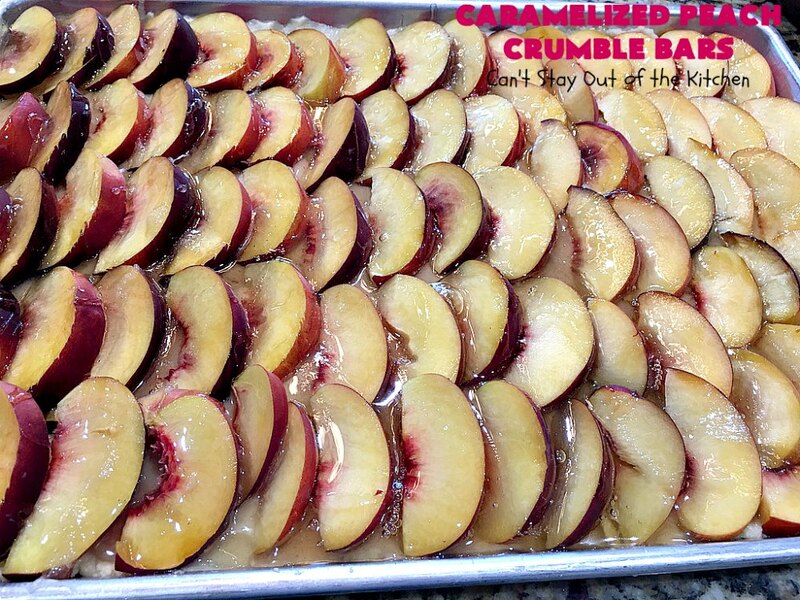 Here the caramelized sugar sauce has been drizzled over top of the peaches. 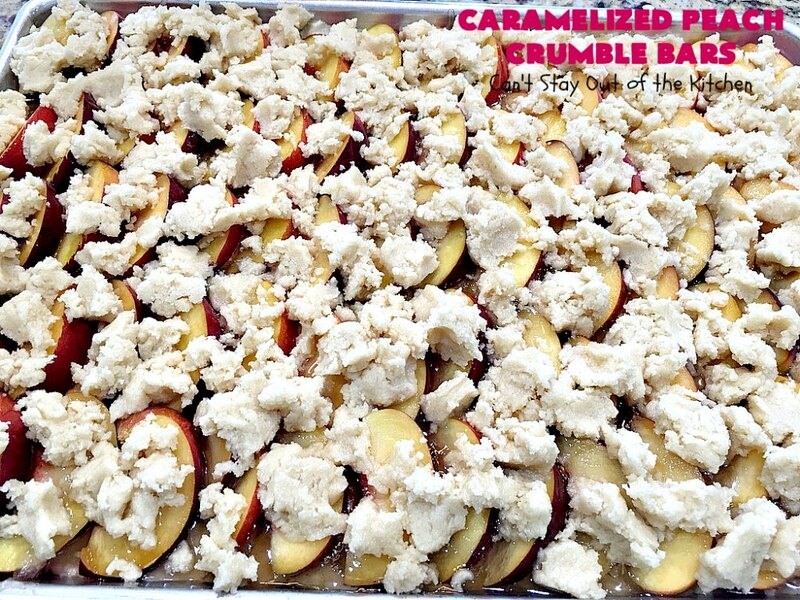 Now crumble the remaining cookie dough over top of the caramelized peach layer. Bake at 350 about 60-75 minutes or until a toothpick inserted in center comes out clean. Caramelized Peach Crumble Bars are so scrumptious you won’t be able to stay out of them. 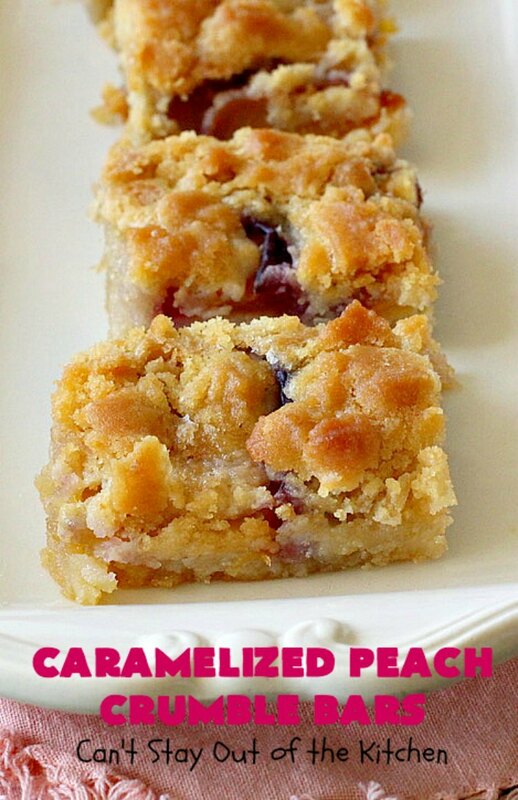 These are sure to cure any sweet tooth craving. Prepare yourself for an explosion of flavor. The caramelized peaches are sensational. Using both almond and vanilla flavorings in the cookie dough as well as the caramelized sugar sauce is a real winner. 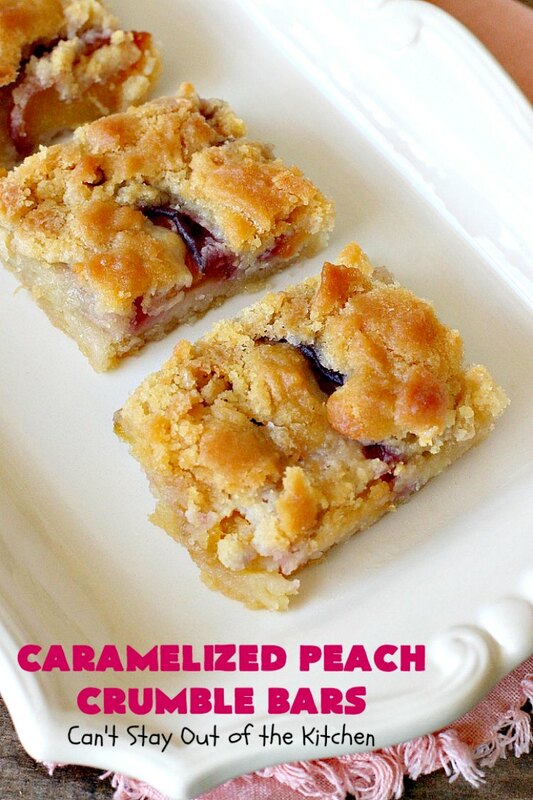 Caramelized Peach Crumble Bars are so delectable. 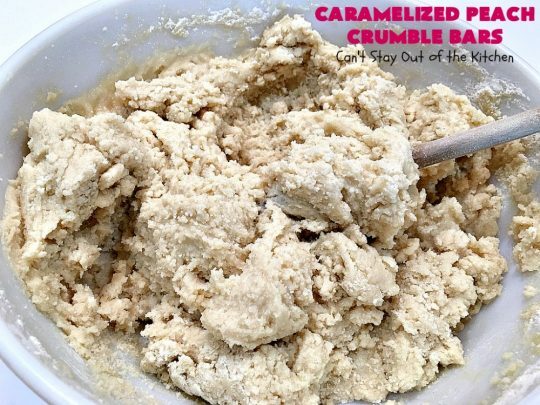 These sensational cookies use a sugar cookie dough made with almond & vanilla extracts. Unpeeled peaches are layered over the crust layer. Then a homemade caramelized sugar sauce is drizzled over top of the peaches. Finally, the caramelized peach layer is topped with sugar cookie dough. 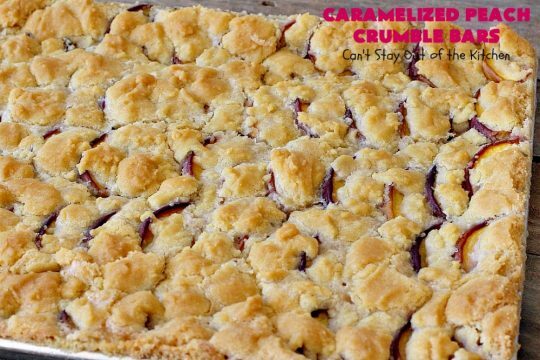 This ooey, gooey and delicious dessert is absolutely decadent! 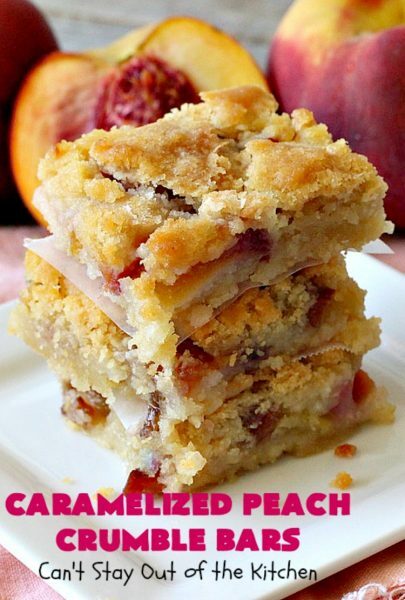 Marvelous peach dessert for company and summer holidays. 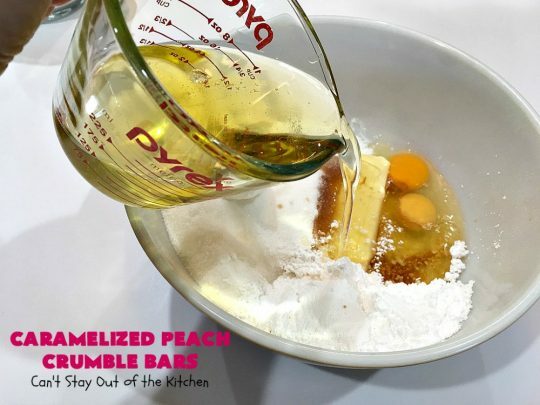 Add oil, sugar, powdered sugar, salt, cream of tartar, baking soda, eggs, vanilla and almond extracts. Press half of the mixture into a greased 18x26” cookie sheet. Top with sliced, unpeeled peaches. Ladle caramelized sugar sauce evenly over top of peaches. Crumble remaining Sugar Cookie Crust mixture over top of caramelized sugar sauce. Bake at 350 degrees for 60-75 minutes or until a toothpick inserted in center comes out clean. 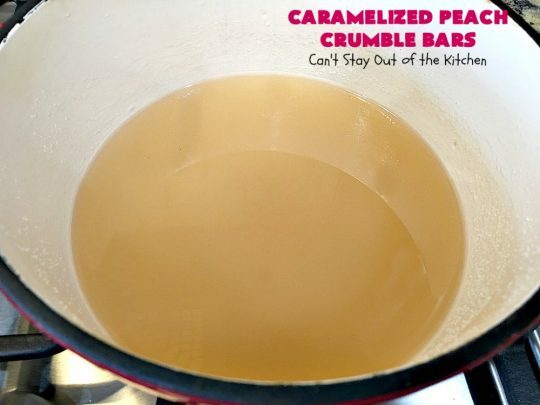 Combine sugar, vanilla and almond extracts and water in a medium saucepan. 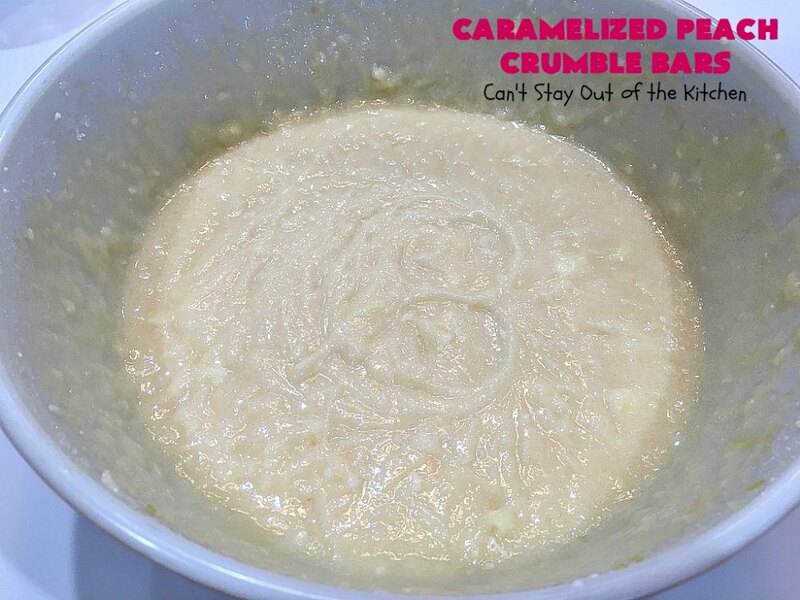 (Do not stir while the mixture is cooking but you will have to remove from heat occasionally and swirl the mixture). Ladle caramelized sugar sauce evenly over the peaches in the cookie sheet. Top with remaining Sugar Cookie Crust by crumbling it over top. 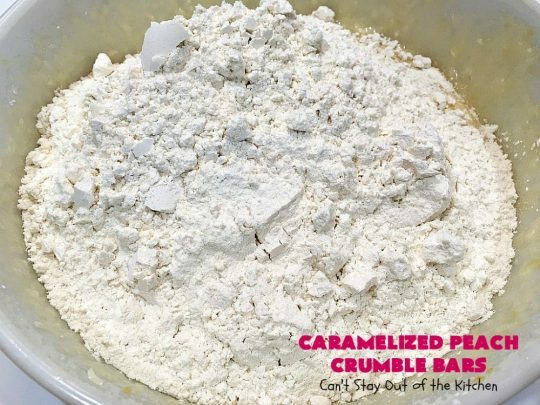 NOTE: You cannot put this recipe in a 9x13” baking dish as it’s too much dough for a single dish. If you don’t have a large cookie sheet (at least 18x26”) you can try putting this into two 9x13” baking dishes, but not one. NOTE: Baking time is going to depend on how fast your oven cooks. When you insert the toothpick in the center it should come out mostly clean. 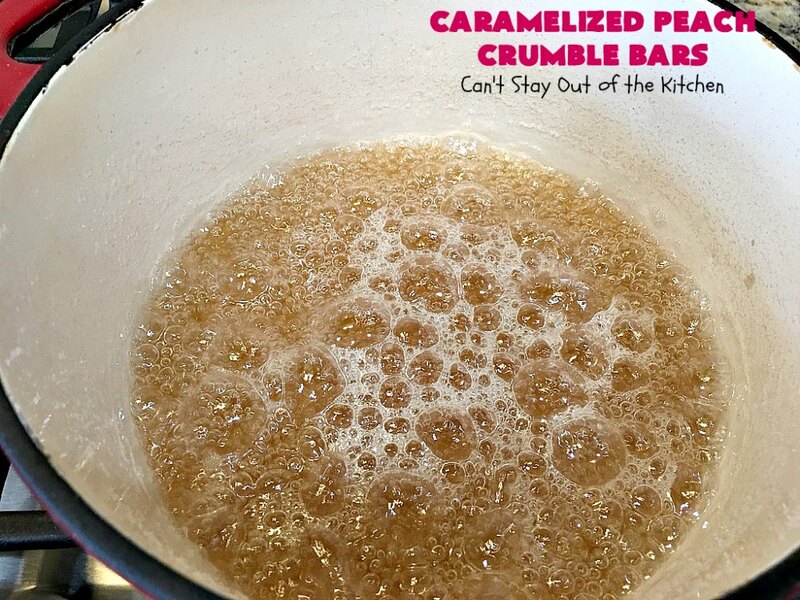 Otherwise, when you cut into the bars after they cool, the recipe will be too gooey and cookie dough uncooked. If the bars are not done and the top starts getting too brown, tent lightly with foil. 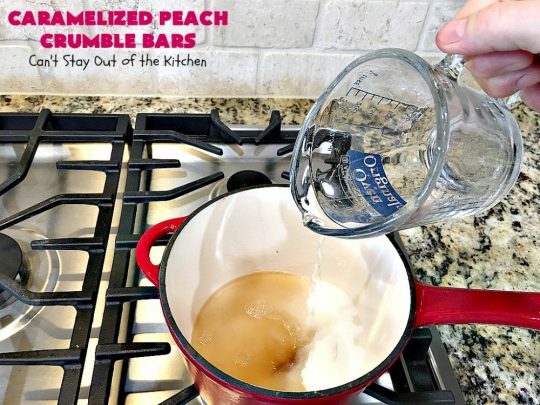 NOTE: Once you’ve hit 15 minutes on the caramelized sugar sauce, you must ladle it over top of the peach slices very quickly or the mixture will harden. (I started my timer as soon as I turned on the gas from the stove top). One of the nice things about making this dessert is you don’t have to peel the peaches beforehand. The cookies are so mouthwatering. These will be the first goodies snatched up at office parties, baby showers or backyard barbecues. I loved these gooey Caramelized Peach Crumble Bars. 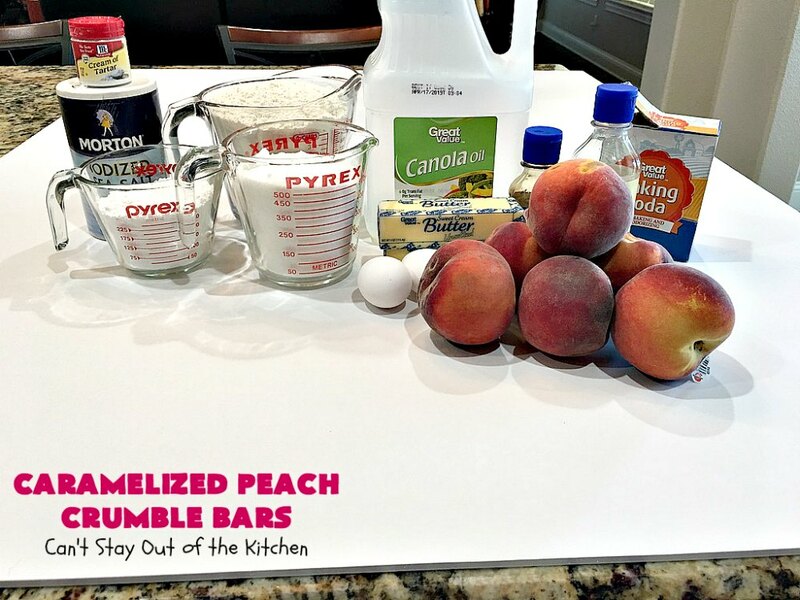 Your peach recipes are the best!